Posted 10/31/2012 6:27am by Steve. I hope you all made it through the Hurricane OK with no damage or loved ones hurt by the storm. We were in preparation mode getting livestock inside safely and getting things put away and parked in safer places than under the trees in the yard. We moved all the Turkeys indoors as the storm approached to insure their safety and to make sure they weren't blown away into Canada with the storm. You Thanksgiving feast is well protected and safe and I think happy to be out of the rain and strong winds. They all go to get processed in 2 weeks and with the damp wet weather we are having we will keep them warm, dry and safely indoors till then I think. The cows were all up on high ground and didn't want to come into the barn at all but with a little coaxing with some fancy 2nd cut hay we got them all in and under cover. Thankfully with us remodeling the barn we were in between with lambs and pigs till the next feeders come in, lambs on 11/1/12 and new feeder pigs on 11/7/12 so we had room to get everything indoors except the tractors which spent the storm outside getting washed !! We are now all buttoned up for winter and will finish putting all our equipment away today. The holidays are fast approaching and I'd like to ask you all to order early so we can set aside what you want for your holiday needs. We are now moved to C29 instead of D29 for the winter months starting 11-3-12. Pickups for Turkeys will be 11-17-12 and Christmas orders for turkeys or holiday meats will be 12-22-12 at C29. As always thanks for your business and your support. Posted 8/6/2012 11:32am by Steve. Right now we are experiencing a severe drought which is impacting the entire country and driving up prices for feed for us and eventually the cost of food for everyone. We have held the pricing on all the meat we raised on the old priced feeds but all the newer Beef ,Pork, Lamb Chicken and Turkeys is costing us a lot more to raise and you will see some increase in prices as we go forward, I just wanted to make you all are aware that waiting to fill your freezers or to order bundles later on will increase your cost . We have 3 whole Beef at the old price of $3.75/lb. hanging and 1 is already spoken for which leaves us 2. We will start the next batch of pigs this month and they will all be on the new pricing when they are done for fall. We are OK for Chicken so far and will hold the price on what's in the freezer. Turkeys will stay at the same price or only slightly higher as we bought a lot of feed and the Turkeys right this year and can pass on the savings.We will not raise the CSA prices to keep it fair and affordable but we will have to put the half shares below 10lbs. a month and the full shares at around 18lbs. a month. We realize that everyone needs to be able to buy affordable food that is high quality and we are trying to make that commitment a reality for all our valued customers. I can tell you that our crop yields on some fields are at 5% or less compared to normal years and we will be tight for forage due to drought. Food will be more expensive next spring so please plan accordingly. Our country cannot continue with flawed energy policies and "grow" our fuel from corn at the expense of the food producers and consumers. Let your Senators and Congressmen know how you feel and vote accordingly to throw the bums out that continue to get us into this mess just for the sake of politics and to line their own pockets. We need to change our government to work for us again. That's the end of my soapbox speech for this month but I wanted you all to be aware of what was coming in the future. Thanks for your business and support. Posted 7/1/2012 7:37pm by Steve. We've been busy here getting hay made for the winter and working on converting some of the older buildings into something usable for our livestock. It hasn't paid very well so far but we are hoping to breathe new life into the old dairy barn as a pig barn and we are getting ready to tear down the old heifer barn to put up a better beef barn/hay storage facility too. We are trying to get it all done before winter hits so we have a little time yet. The CSA is growing steadily and we want to thank everyone who is trying it out so far. Feedback has been positive so far and we are looking to keep it growing. I also wanted to let everyone know that we will be tight on beef this fall so if you want a side or a quarter please let me know so I can plan our inventory better and meet your needs. The turkeys all have feathers and are out on grass now. Jake says it's like watching Velociraptors in Jurrassic Park the way they bob in and out of the grass and weave around. They are doing well and we will have USDA processed turkeys frozen for Thanksgiving and Christmas this year so please order yours as we only have 109 to sell total including the ones we need for our family !! Posted 5/6/2012 8:59pm by Steve. I would like to inform you a little bit about the BSE or "MAD COW DISEASE" that's been in the news lately. The fact that they found this cow at a rendering plant and not in a pet or human food chain shows that the safeguards are working and that the U.S. food supply is safe. It was an older cull dairy cow and not a beef cow who was going to be rendered into non-food products. The USDA thinks she had a genetic mutation and didn't get it from eating other animals as her feed ! Actually since 1997 there have been no ruminant meat or blood products allowed to be fed to cattle anyway, and with our Natural program we never feed animal products to any of our livestock anyway. Posted 4/23/2012 8:50pm by Steve. Hi Everyone ! 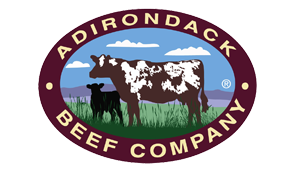 Welcome to our new website for the Adirondack Beef Company which we designed to keep you informed and aware of how your food is produced and what's happening on the farm. We always want to improve this website and are always looking to hear from you our customers with suggestions and ideas to make it better. Here we go and welcome to the first farm boy blog you probably ever read. A lot has happened in the world of agriculture since we were at the Syracuse Regional Market in December. Grain prices softened up a bit making feed a little cheaper but any savings we saw were eaten up by higher diesel and gas prices. Diesel going into crop season doesn't look pretty. The "finely textured beef" scare happened ( aka "pink slime") which made all of us in the beef industry crazy with all the lies and speculation in the media from all the so called "experts" giving their take on the issue. The veterinarian that did the work in the 1990's on approving the practice was never even talked to so it was definately a scary situation. I can tell you that our ADK Natural Ground Beef has NONE of the finely textured beef in it,and with our ADK Ground Beef all you get is meat grown by us here on our farm with nothing added to it. We as my nephew Tom says are responsible for our beef from "conception to digestion". We grow it,Tri Town Packing packages for us under USDA inspection and we sell it directly to you, that's the supply chain from us to you and your family. As safe and wholesome as we can make it with emphasis on quality and the best animal care and sustainable farming practices available to us. I didn't want to preach to all of you in my first ever blog but I had to set the record straight and let you know where we are coming from with our meat. We feed our family what we sell to you so you can rest assured that we do it right for everyone.